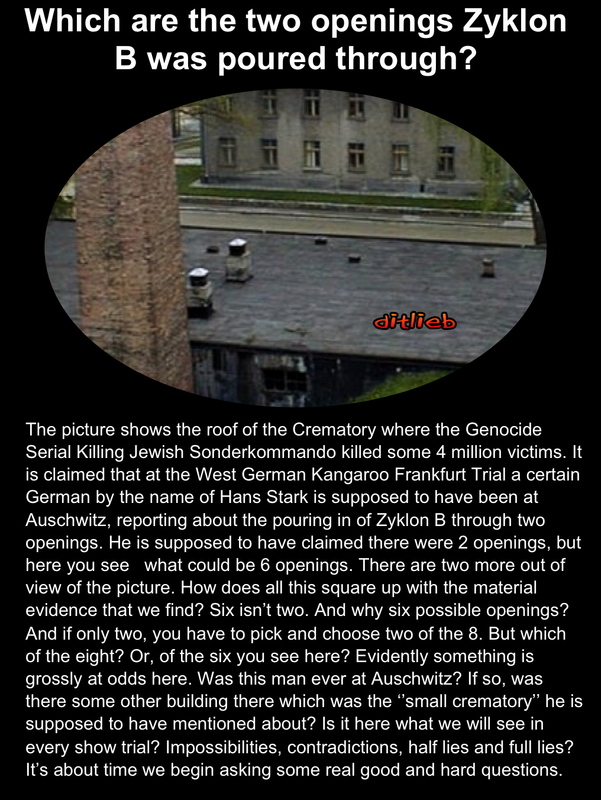 INTO WHICH OF THE TWO HOLES WAS ZYKLON BE EMPTIED AT AUSCHWITZ HOLY SHRINE? Exterminationists, the cultists of the Holocaust Extortion Cult, inform us that Zyklon B poison was poured into TWO openings at Holy Shrine 1 at Auschwitz. But which TWO holes, or openings? What is your opinion? Previous Previous post: Should Auschwitz be made into a Nudist Camp? ditliebradio Into which of the two holes was Zyklon B emptied at Auschwitz Holy Shrine?